At least one Oregon children's hospital is now employing two unique therapy animals to help patients smile: an alpaca named Napoleon, and a llama named Rojo (see slideshow to the left for more pictures). "I never realized the power animals have to bring healing and joy to people like this," said Kelly Schmidt, a social worker at Providence Children's Center in Oregon. "I truly believe they are given a purpose more than just entertainment." Rojo is an "old pro" at making children happier, according to Schmidt. 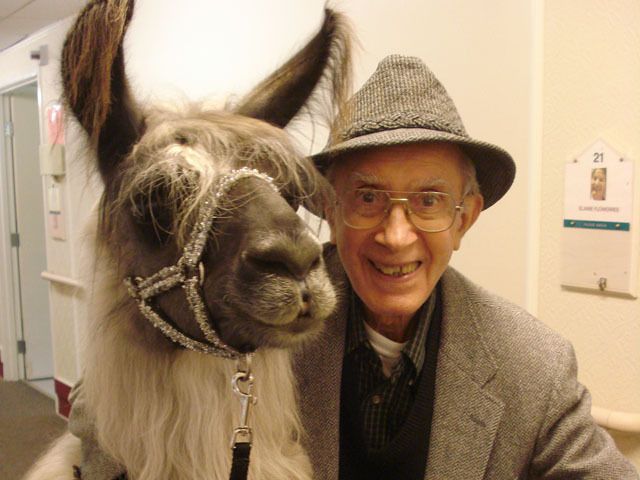 His owner, Lori Gregory, operator of Mtn Peaks Therapy Llamas and Alpacas in Vancouver, Wash., told the station that once at a local fair someone suggested her huggable llama become a therapy animal. The rest was history, and Gregory said like the patients, she too feels a rush when she introduces her animals -- which are often dressed in funny hats and other silly outfits -- at hospitals and other medical facilities. "That's why it started giving me chills and that's when it kind of became an addiction," she told KOIN 6 News. "When you realize that they have this amazing ability to create a natural response therapeutic-wise to get people to do things they normally wouldn't do."